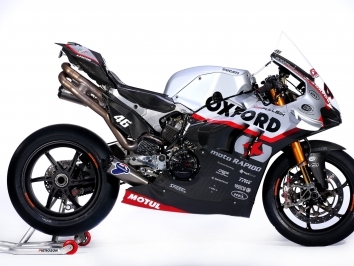 Oxford Ducati team owner Steve Moore has admitted some surprise over the pace showed by his new Panigale V4R given the lack of development time before testing kicked off last week. The squad had only a few weeks to begin preparing the bike for its debut at Monteblanco and it has been a trial by fire - something Moore is used to - getting the limited electronics, fuel maps and firmware installed while rider Tommy Bridewell is also trying to get in track time. Moore is very familar with converting electronic-heavy Panigale road bikes into electronic-light Panigale race bikes, but this is the team’s first go at something that isn’t a V-twin and making it work with the MoTEC spec-ECU. “Knowing what we do about the electronics and the motorcycles, it was easier this time. We managed to come up with quite a lot of the data. People think we only need to do the mapping on it. There was about 50 hours of number crunching before we even put it into an ECU,” Moore told bikesportnews.com. “We had to dissect the road bike ECU again - which works in a totally different way to the MoTEC - and that helped us a little bit. There are something on this bike - like its bizarre firing order, two-position inlet trumpets - that we have to work out and how to get engine braking out of a super-high revving four-cylinder engine. “There are lots of things four-cylinder bikes do that the twin doesn’t do. The four-cylinder bikes effectively reduce the power to two cylinders coming out of a corner. We thought we would have to learn that, but the power is so smooth on the V4 that we haven’t even started looking at it. Electronically, we had to work through everything we can possibly do. Due to the strict noise regulations, Termignoni have had to fabricate a completely new exhaust for Oxford and Be Wiser to use in 2019. “The exhaust system arrived at the circuit, so we had to do the theoretical fuelling for that and then on track, so the first couple of days we spent getting the fuelling right. And get it so it didn’t have a horrible throttle. “This is to meet with the noise regulations in BSB. The exhaust is unique to BSB, it’s only PBM and us that have it. We dropped a bike to them in February and they have been working out how to fit it since then. “It’s easy to make it quiet, it’s easy to make it powerful. Making it quiet and powerful is very hard work, so they have done a hell of a job. That was the challenge with the strict noise regulations in the UK. We have to be absolutely squeaky clean. Then we have to make sure the bike is rideable with that exhaust. That was about making a good throttle connection with lots of power. Moore and Bridewell are both happy with the way it went with the Devizes rider putting in a run of ten successive 1’44s laps in the morning of the second day to get an idea of how the bike will behave from the start of a race on a full fuel load. “It was successful. We had a plan and we got through it all, and some of the other bits by lunchtime on the second day in Portugal.